In the latest from Pixar they delve deep into the limbic system and develop the group of forebrain structures into something of an imagination land of their own, completely powered by personified emotions that manage our most treasured possessions-our memories. While the limbic system includes a number of sections of the brain including the hypothalamus, the amygdala, and the hippocampus what is more important is that these hard to pronounce names are what allow the human brain to develop and exercise such abilities as motivation, emotion, learning and again, memory. 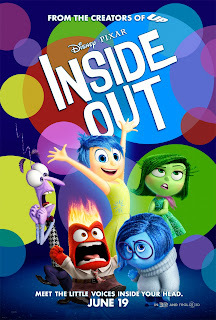 That Pixar, including director Pete Docter (Up) and his team of writers and animators, have been able to create a world out of this cerebral cortex (that actually grows thicker as you learn to use it) is the first of many accomplishments with Inside Out. That they are able to somehow use this platform as a way to dissect and discuss the passage of time, the stages of life and the love a child has for life and the parents who love that child is pretty incredible. This also puts them in a prime position to explore the type of territory they are best known for. Eliciting emotion is a difficult task for any piece of celluloid, but especially when the characters and situations intended to elicit those emotions are created from scratch-physical being and all. So, what makes the studio as a whole so capable of doing this time and time again? The answer seems to be in that it’s very keen on how these thoughts are presented. Yes, the characters are of an extremely cute quality with their variety of bright colors and their distinctive voices provided by a talented cast, but that these characters hold the power of the mind so precious to their imaginary hearts forces the audience to take the most minor of events that affect them as tragedies in our own hearts as well. This, combined with the fact the film deals (again) with the inevitable changes of life that come with growing up and how hard those changes can be to accept and adapt to allow for Inside Out to settle firmly into the ranks of Pixar’s most celebrated, even if it’s not it’s best. 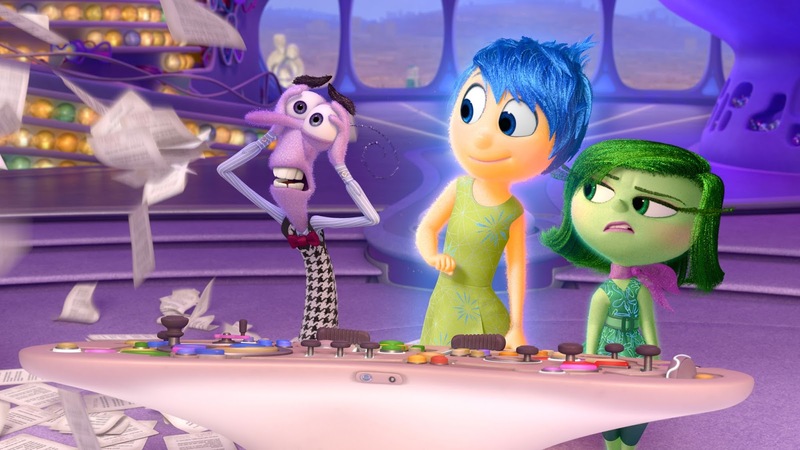 From left: Fear (Bill Hader), Joy (Amy Poehler) and Disgust (Mindy Kailing) man the control desk. 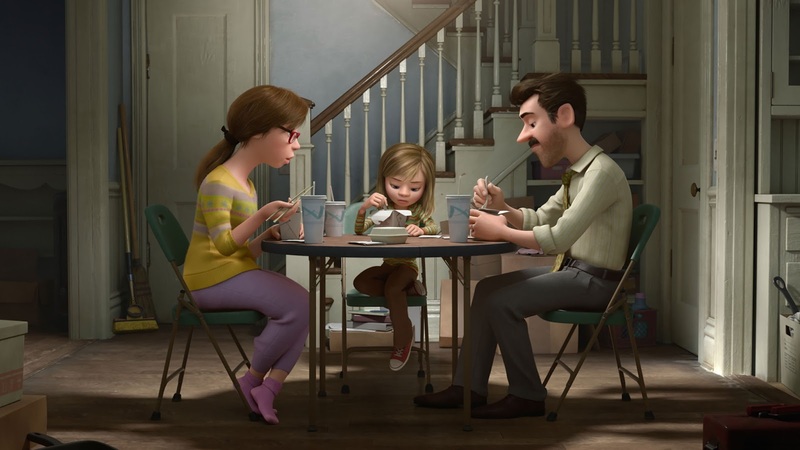 Like what the Toy Story films came to represent, Inside Out is a parable of how we retain our child-like qualities while also evolving and the difficulty in accepting and dealing with the natural change that comes as we grow older and (sometimes) wiser. We are introduced immediately to Riley (Kaitlyn Dias) as an infant and inside her newborn brain (that is almost the same size as an adult brain and contains most of the brain cells for her whole life) is where Joy (Amy Poehler) first springs into existence. These personified emotions continue to pop up as Riley develops further. At her first cry we are introduced to Sadness (Phyllis Smith), her first instance of being scared gives us Fear (Bill Hader), with her first try at broccoli bringing on Disgust (Mindy Kailing) and her first bit of attitude being the product of Anger (Lewis Black). These five core emotions orchestrate an elaborate system of memories and manage the day to day dealings by appropriately engaging with Riley’s conscious to react to whatever might cross their human’s path. These reactions are based on a set of core memories and the pillars of Riley’s personality that currently include such cornerstones as family, hockey, friendship and, of course, goofiness. High in the headquarters above the rest of her brain these emotions sit to experience the highs and lows of a pre-teen girl. It is when Riley is uprooted from her Midwest life after her father (Kyle MacLachlan) starts a new job in San Francisco that things begin to take a turn for the resistant. As Riley and her emotions struggle to adjust to their new life Joy and Sadness find themselves separated from the other emotions who must continue to guide Riley at headquarters. Through their adventures in trying to get back to headquarters both Joy and Sadness learn a few life lessons and discover more about Riley than they might have thought possible were a new city, house and school (or change) never introduced. Inside Out purposefully takes place during this transitional phase in Riley’s life and so we have a reason for the core, imaginary characters to discover exactly how complex they themselves can be. As mentioned before, it is the imagination used in bringing a concrete reality to the thought process and how such feelings come to be expressed that allows Docter and the rest of his crew to really go the distance here. A certain sequence where three of our characters go through a part of Riley’s brain that processes abstract thought is a visual treat where the imagery perfectly embodies a word that literally means it has no concrete existence. As Joy, Poehler perfectly balances her witty and manic persona to provide the right amount of liveliness and fluff to make her titular emotion ooze out of every syllable. Smith’s voice absolutely embodies what one might expect a constant state of sadness to sound like while Kailing, Hader and Black are each somewhat obvious choices for the given emotions with Hader being the dark horse that we can expect to be able to pull off anything and he indeed does just fine with what he has to work with. At first it seems Smith’s Sadness will leave the biggest impression given one can glimpse fairly early that her arc will be significant and in fact while the culminating realization that there can be no appreciation of the good without the bad, that there can be no joy without sadness, is sincerely moving it is another character altogether that takes the cake as the easy fan favorite and the one that will tug hardest at the heart strings (plus, we all know we were pretty annoyed with Sadness about twenty minutes in). Forgotten, but not completely disregarded and now living within the caverns of Riley’s brain is her imaginary friend, Bing Bong (Richard Kind). Part dolphin, part elephant, but mostly made up of cotton candy, Bing Bong is a pure representation of innocence and that the film ultimately touches on a transition in life where a level of innocence is shed makes his involvement all the more meaningful and heartbreaking. Yes, a hybrid elephant and dolphin with a body of cotton candy who sheds tears of candy will bring tears to your eyes. Riley (Kaitlyn Dias) sits down with her parents (Diane Lane, Kyle MacLachlan) for dinner at their new house. To be frank though, Inside Out comes along at a critical point in my own life; one where it means more to me than it might have had I seen it prior to having my own child. At the time of its theatrical release my own daughter (who is all I saw as I watched Riley mature) is a young eight and a half months old and so to see this representation of time passing, the necessary appreciation of moments present and the inescapable fact we can’t control time and we can’t make any more of it is both greatly depressing yet ultimately eye-opening. This is heavy stuff, no doubt, but it’s what Pixar is accustomed to working with and here, in making the overall goal of the film to ensure the happiness of one child, both parents and children alike can understand and really feel the precious nature of the situation. In a world where super hero and dinosaur movies dominate, the well-being of one little girls happiness may not sound like the biggest stakes you can imagine, but when the idea of Riley losing her goofiness, losing a part of what makes Riley “Riley” there is nothing that seems worse or more sorrowful considering how this might alter who she eventually will become. To root against this is completely logical, we want to attach ourselves to as much of what makes us “us” in our childhoods no matter how old we get and to see that slipping away not only hits home for every parent in the audience, but as the personified emotions feel a parental sense of responsibility for Riley’s well-being we see the disappointment in their faces as well. There are detractors from the film, mainly the feeling that the writers had to come up with one too many extra obstacles to keep Joy and Sadness from returning to headquarters too soon so as to lengthen the movie to feature length, but while Inside Out may not be the masterpiece I’d hoped it to be it still flexes its imagination muscle as far as the eye can see and is affecting in a way no other animation studio can dare touch. Tears of joy, indeed.